I didn’t understand what that meant when I first read it…I mean, we are talking Stephen King. For those, like me, who look at that phrase and feel a wee bit squeamish at the thought: It means to dissect from your work those little portions you loved writing and felt were imperative at first, but now realize the only reason for keeping them is not for progression of the story, but because you love them. A darling can slow down your story. I recently read a western romance, where a whole scene really should have been removed. It was roll-your-eyes-stupid. Worse, the author (seemingly) justified keeping her darling by referring back to that scene multiple times. I just can’t see a killer as compellingly serious when my focus is directed back to a comedic scene. A story that could have been a decent romantic suspense instead turned into a quasi-comedy. Kill your darlings. Deciding what is a damnable darling and what is an integral darling can be difficult; yes, I feel they both exist. You may have an amazing scene between your two main characters. It was so fun to write the keys were smoking as you typed. The scene helps to show the reader vulnerabilities we didn’t know about before. You laugh, you cry, then you cry again. You edit it to near perfection. That is an integral darling. On the other hand, you have an equally fun scene that you wrote with all five senses, you laughed, you cried, it is excellent…but it doesn’t further the story. Sorry, that is a damnable darling. That wondrous piece might work in another MS or on your wall, but in that story you are popping readers out of the real action left and right. Kill your darlings. 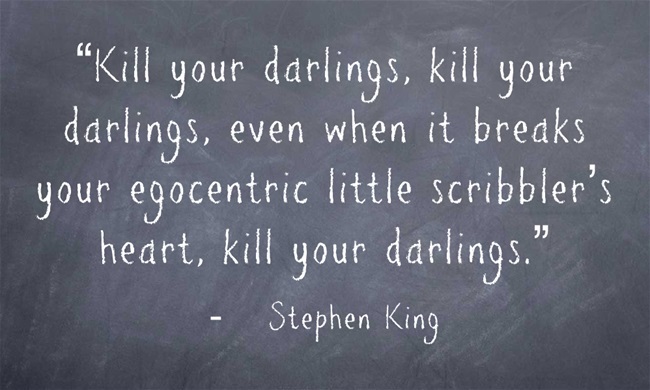 There’s no two ways about it, killing your darlings is a difficult process. They aren’t called darlings for nothing. So, I’ll give a few suggestions that I’ve used, then confess to my own murder and even give you my motive. So let’s jump in with both feet. I’ve done two things with scenes that I’m not sure of. When I don’t know if they should meet the chopping block or should simply be modified to make them fit with the book as a whole (be it voice, point-of-view, topic, or progression). Reveal a character flaw or fear? Resolve any of the above? If it doesn’t do any of those things…Kill you darlings. Some scenes are not so blatantly darlings, they whisper necessity in your ear because one little part of them reveals something in a new or interesting way. For those scenes/phrases/paragraphs I highlight them in an obnoxious bright color so that I can proceed with the remainder of the edit. It is possible that with the clarification of editing, that darling can go under the knife. If not, tighten it up, clarify it, hone it. I have alluded to my novel a few times. I’m about to share more with you about it than I have thus far. Only the beta readers read the portions I’m going to tell you about. My darlings were actually part of my whole onus for writing my manuscript. When I got the story actually down, I realized it wasn’t even about what I thought it was. Originally, I thought my story was on redemption after great loss. The opening centered on a tornado taking the life of Chase, the husband of the main character. I focused the first four chapters on his death and Meg’s pain. While those things are important, poignant, and harsh; they aren’t a love story. I thought they were necessary to bond with Meg. I wanted my reader to feel what I felt when I thought of my poor Meg. But a romance isn’t about pain, at least not in the first four chapters. Originally, on page five of my novel, Chase (Meg’s deceased) is praying for the Lord to bless them with a child within the next year. That leads me in to my last darling. I cut it last night. I had an epilogue on my story that wrapped that up nicely. It was a graveyard scene where Meg is talking to Chase on the anniversary of losing him. Once I killed the beginning, the ending was left just dangling there like wilted confetti after a parade. It had to go, but it hurt to do it. By hacking off the epilogue, it left the final words of the main characters as stronger than they were when followed up by three pages of future that are handled in the next book anyway. Repeat after me: Kill your darlings. Do you have a work in progress (or even published) that just isn’t as stellar as you’d like it to be? Go through it with an editor’s eye. Ask yourself those questions I wrote above and don’t be discouraged if areas have to be trimmed or cut completely. You may find your story goes from “a romance novel” to “a novel that explores how societal norms dictate our romantic choices” or “a romance novel on love and its various iterations within a historical context”. Either way, it’s worth it. Kill your darlings. Photo taken from Pinterest, I could find no attribution.